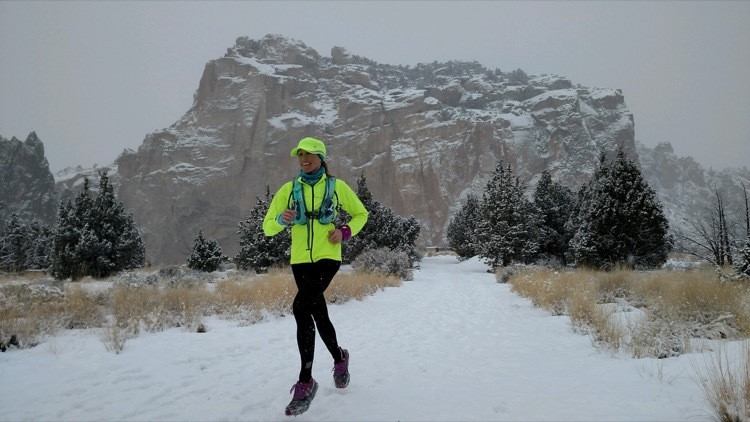 Ladia Albertson-Junkans logging some winter miles in Central Oregon's Smith Rock State Park. 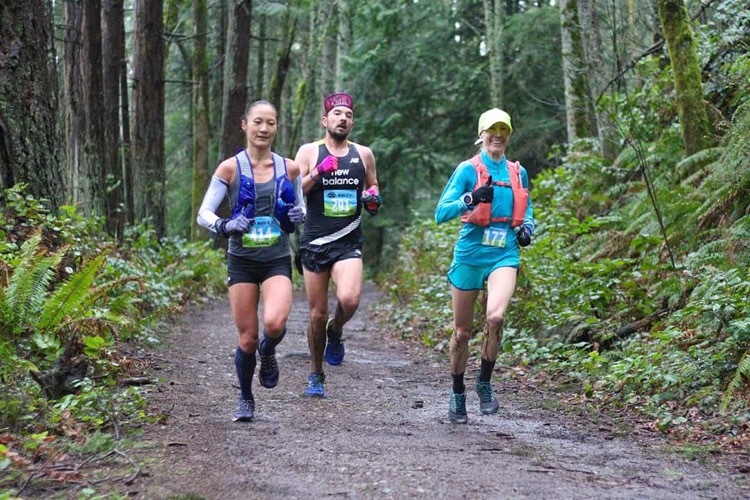 With her 4:17:44 finish at the 25th running of the Chuckanut 50K in Bellingham, Washington on March 18, Ladia Albertson-Junkans became the fourth-fastest woman ever to race Chuckanut (full results here). Her time ranks only behind the impressive trio of Jodee Adams-Moore, Ellie Greenwood, and Magdalena Boulet. And this in her first ever ultramarathon. But Albertson-Junkans’s newbie status in ultras comes after a decade of competitive results at shorter distances. An All-American runner at the University of Minnesota in the mid-2000s, Albertson-Junkans also ran for Team USA at last summer’s World Mountain Running Championships. In this interview, she takes us through her top-notch ultra debut, what she learned along the way, and what else she has in store this year. Read on to learn more about this breakout runner and her varied background, as you’re sure to see much more of her. Quick & Dirty: Congrats on your win at the Chuckanut 50K this weekend! You bested a fast, experienced, and competitive women’s field that featured multiple past World Championship team members like Camille Herron, YiOu Wang, Maria Dalzot, and others. Take us through your race and how you came out on top. Ladia Albertson-Junkans: Thank you! It was so fun to toe the line with women I’ve admired from afar for years. I was given the advice to not go out too hard, as can be tempting with such a flat first 10k. I had full intentions of following through on that advice, but I didn’t. YiOu and I started chatting within the first mile, and even though we were going faster than I wanted to be running, it was more important to me that I have fun and enjoy the moment. I knew I’d likely pay for it later (which I did), but I don’t regret it one bit. The camaraderie and community is what makes racing extra special to me, and that’s what I was most looking forward to going into the race. YiOu and I caught Camille just before the first climb, and that’s when I took the (overall) lead. Being new to the distance, there was certainly some anxiety in taking the lead that early in such a long race (‘Am I pushing too hard too soon? I have no idea if my body can sustain this!’). I could either stay with the more experienced runners and try to do what they do, or I could run by feel and just see what happened. I chose the latter. Whenever I questioned that choice, I reminded myself to stay in the moment and take it one step at a time. I felt strong on the climbs and just rolled with it. Having run on the trails of the Chuckanuts before, I knew the Ridge (a highly-technical 2.8-mile mid-race stretch) would be a challenge for me, and it was. I was “warned” in advance that the North Lost Lake section can feel long and remote, which was useful to know for managing expectations and making sure I stayed present as motivation waned. Chinscraper (the final big climb) burned, as expected. The long descent down Fragrance Lake Road outdid me; I knew going too fast could trash my quads, but my legs felt too tired to do much breaking. So, I just went for it and gave myself over to gravity. The whole thing felt like one big experiment – or many little experiments? !—which, for me, is part of the fun. Q&D: This was your debut ultra race. How did you take to the distance, both mentally and physically, as well as all the little things like in-race fueling and managing low points? Mentally, my mantra was “in the moment, in the moment” to encourage myself to stay in the moment and not let my mind wander too far ahead, e.g., to the next big climb or all the miles to go. It was also important to me that I not let the physical demands and potential low-points of racing take away from how grateful I am to do something like run 50k. I made a point of taking in the scenery and marveling at the natural beauty whenever I felt myself being tempted by negative self-talk. Said friend had also told me before the race that a lot can (and will) change over 50 kilometers. This was particularly helpful insight when I first started dry-heaving along the Ridge trail. It gave me reassurance that this, too, would pass and that the next mile could feel completely different, for the better. Physically, the final 10k along the interurban felt a lot like running with 20-pound weights on each ankle. The quick start and long descent late in the race trashed my legs just as everyone said they would. Staying in the moment and keeping the joy became even more important in those final six miles when I very well knew that my body could completely shut down at any moment. And what a privilege to get to such a point! Because, wow, it’s truly amazing what the human spirit can do when our bodies are at their weakest. When we think our bodies are done for, and yet they keep going. Q&D: This year’s Chuckanut also served as the final qualifying race for the IAU Trail World Championships, a 50k race that takes place in Badia Prataglia, Italy in early June. Do you know yet if you plan to accept your spot on Team USA? LAJ: Yup, I accepted just this week! I am very excited for this opportunity and grateful to the many trail folks who make these opportunities possible for us. Q&D: Can you tell me a bit more about your running background—from your prep running career and competing for the University of Minnesota, to your post-collegiate racing and decision to start racing on the trails? LAJ: I ran XC, indoor/outdoor track in college at the University of Minnesota (Go Gophers!). After that, I took a break from competitive running but still ran casually while I focused on starting my professional career. As my work schedule became more predictable, I started running more consistently, and I eventually found myself clocking fast times again. After a few good road races, I had the opportunity to join the professional running group based in Minneapolis, Team USA MN, while still working full-time. Under Team USA MN, I competed in road races from 10k to half marathon, placing in the top 10 at several road national championships and making a U.S. team in cross-country. The trails have always appealed to me, as have mountains. The more time I spent in the mountains, the more I realized what amazing places they are to run. Trail running has become a wonderful marriage of my love for running and my love for moving in the mountains. Q&D: A couple years ago, you left your Minnesota home for Seattle, Washington. Can you tell me a bit about what motivated your cross-country move? How have you enjoyed the Pacific Northwest thus far? LAJ: During the last ten years I lived in Minnesota, I traveled to the mountains every chance I had, often catching red-eye flights after work on a Friday, playing hard in the mountains for 36 hours, sleeping in the airport Sunday night and flying back on a Monday just in time for work. Over time, I worried that this was not sustainable long-term. So, when it turned out that my sister and my now-fiancé’s sister both lived in western Washington where there were (gasp!) MOUNTAINS, we decided to make the move and see if living near mountains was really as awesome as it seemed in our dreams. Turns out, for us, it is. We love living close to mountains; running or skiing before work, exploring new and increasingly remote places on weekends, and challenging ourselves on new terrain over new distances. 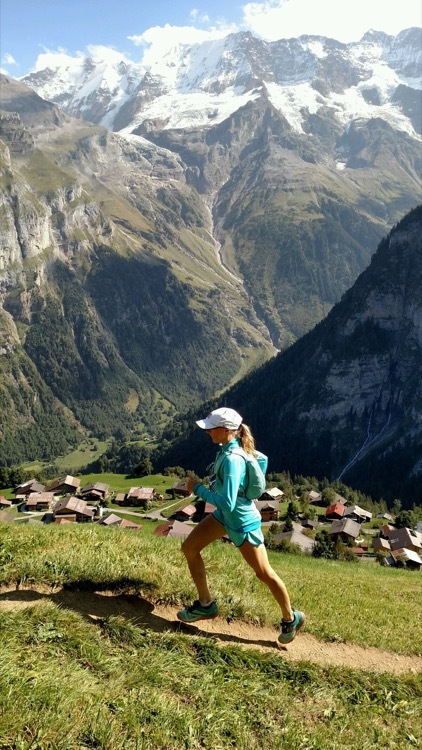 Albertson-Junkans enjoys a training run in the Swiss Alps above the town of Gimmelwald. Q&D: Last year you represented the USA at the 2016 World Mountain Running Championships in Bulgaria, where you finished 15th overall and helped Team USA to a bronze medal. What was that experience like, and do you have plans to try to make the 2017 team? LAJ: Racing at the World Mountain Running Championships was a huge honor and very special to me. From very early on in my running, I have marveled at the places running can take us, not just literally on foot but also in where it leads us for races. For me, running is an opportunity to explore the world and meet new people. The World Champs was all of that – and doing so on behalf of our country made it extra special. I do have my sights on making the 2017 team; it’ll be a very tough team to make, but I will do my best! Q&D: What else is in your plans for this year and beyond? Was Chuckanut a first step towards a concerted focus on ultra distances? LAJ: I like to keep a very open mind and just act on the whims of my curiosity. In other words, I’m open to anything and like to mix it up. For example, I decided on short notice to run the U.S. Cross Country Championships in Bend, OR this past February. I signed up on the last possible day, 10 days before the race, despite having done no XC- or 10k-specific workouts. It was super fun and very different from any of the racing I had done in the two years prior. I am registered for the 2017 U.S. Mountain Running Championships in early June, but have no plans beyond that (and now the 50k World Champs).